Over the Counter | Marathon Orthotics, Inc. The Over the Counter (OTC) and Dynamic Assist OTC braces are precursors to custom AFOs and are priced to stock in your office for immediate patient relief. The slim, compact design and open posterior ankle plate provide superior shoe fit. 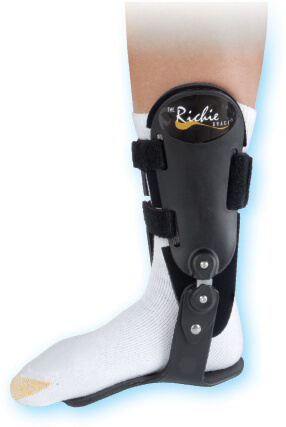 The soft upright pads and resizable Velcro straps adjust the brace for a wide range of leg sizes. 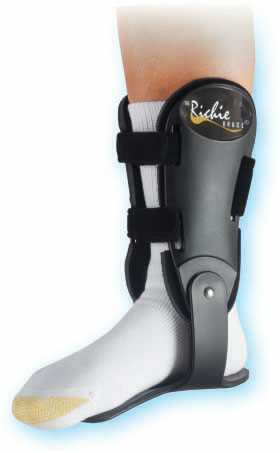 The OTC brace was created for unique ankle sprains. This brace is designed for drop foot type conditions where weakness of the muscles, tendons, or ligaments around the ankle inhibit dorsiflexion of the foot at toe off. For pricing and reimbursement figures, please contact us.